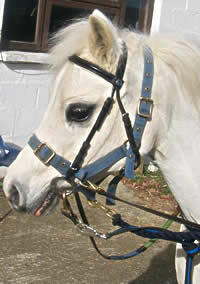 Blue is on loan to the group and is a much loved family pony. He is tiny at 12hh with very small ears and is a huge favourite with riders. He loves people and is extremely tolerant of any attention he receives. Many feel they would like to take him home in their car boot. However, although very small, he can go quite fast when out hacking, few can keep up with him.